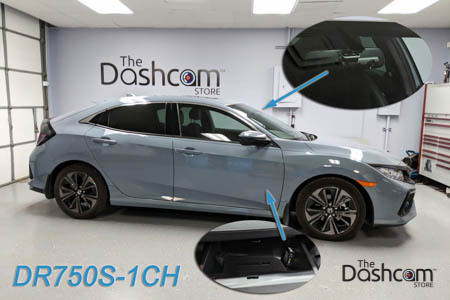 The DR750S-1CH is designed to mount in the front and rear windshields to record audio and video of what is going on in front of and behind your car. With simple plug-and-play operation, you can be safely recording both in front of and behind your car in Full 1080p HD, in a matter of minutes! For parking mode, you either need to plug the DR750S-1CH into a cigarette lighter power outlet that is on all the time (even when the car is turned off), or you can opt for the Power Magic Pro which is a BlackVue accessory that quickly integrates with your car's fuse box and will supply constant power to the DR750S (while also ensuring your car battery does not drop too low). Get the BlackVue DR750S-1CH and Power Magic Pro combo for ultimate protection and peace of mind! For a hard-wired installation, and so that you can enable "Parking Mode" recording, we recommend pairing the DR750S-1CH with the Power Magic Pro battery discharge prevention module. Please see our BlackVue installation page for more information on DIY installation with a Power Magic Pro, or check out some of our BlackVue dashcam installation photo galleries to see what the 750S will look like installed in a vehicle like yours. The DR750S-1CH includes FREE priority ground shipping anywhere within the United States. Expedited shipping (2-day, overnight) may be selected during checkout for an additional fee. International shipping is not available on this item, except to Canada or Mexico. A signature will be required on delivery, because unfortunately, package theft is a very real problem when shipping high-value electronics. We thank you in advance for your understanding. Please note, BlackVue products can only be shipped to addresses inside the United States, Canada, or Mexico. We apologize for any inconvenience to our international customers.The Dashcam Store™ is an official North American (USA, Mexico, Canada) distributor of the BlackVue product line. Beware of unauthorized or grey-market third-party sellers!